Rise and Shine Orphanage is a small orphanage outside of Kisumu Kenya.It is managed by a young Kenyan couple. They were deeply moved by the plight of orphans in their village. They teach the children small handcrafts so they will have some skill when they are finished with school. The sale of the crafts help support the orphanage. This sleeveless children’s shirt set is made by Mary who makes the children’s clothes. 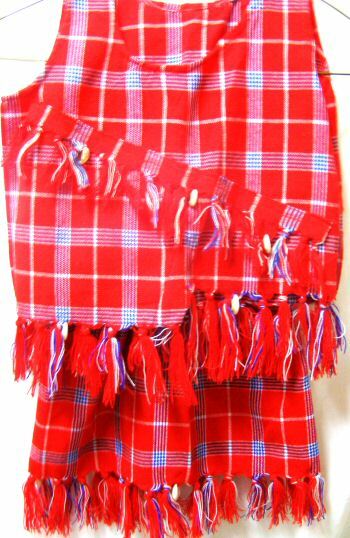 The fabric is from a Maasai Shuka and is designed using the native shell called the Cowry Shell. This Cowry shell is used to decorate the shirt as well as the bottom fringe. Shirt Measures: Shoulder to shoulder 9″ and across chest measures 13″ laying flat on table. Shoulder to fringe measures 14″. The elastic waist skirt measures 6″ relaxed and 24″ fully extended. It is 13″ from waist to fringe.